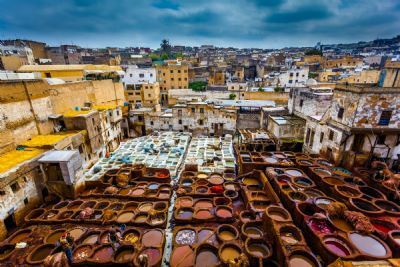 The tea tradition is and has been a central part of Moroccan social life extending friendship and hospitality often involving an intricate brewing process and fairly formal service “atai”. Tea leaves are brewed the liquid is then poured back and forth between glass and teapot from a height waiting for a froth to appear on the surface only then is the tea ready to be drunk from the small glasses an art that is passed down from one generation to another. Maghrebi (mint tea) which is most associated with Morocco has a long history however conflicting stories exist as to the origins the most commonly accepted is that it was introduced in the mid – 19th century by a British merchant who was able to sell his “gun powder tea” following the Crimean War the tea immediately became sought after which the locals tailored to their taste sweetening it and adding mint its often called “gunpowder tea” today giving some validity to the story. Other stories suggest the tea was introduced much earlier by Arab traders or that it was introduced as a gift by Queen Anne of England during the 17th Century. Nowadays the tea most commonly drunk in Morocco is a Chinese green tea as one of the world’s largest importers of this tea, sugar and fresh mint leaves are traditionally added varying slightly in the different regions and seasons. In the Berber region you will often get herbs such as lemon grass, thyme, sage, or dried flowers. As few people drink Alcohol in Morocco tea is the equivalent used regularly in social situations and is sometimes known as the “Berber whisky” drunk all day long served in colourful glasses which make a great souvenir and reminder of your Moroccan trip, when Tea is served to guests it is often served three times and is meant to be savoured and enjoyed. A word to the wise if you are offered tea in a private home or shop it is considered impolite to refuse and the person may take offence, it’s a part of normal hospitality.